<> is ... the same as !=. It's true that they are, functionally, the same. However, how the SQL optimizer uses them is very different. =/!= are simply evaluated as true/false whereas <> means the engine has to look and see if the value is greater than or less than, meaning more performance overhead. Just something to consider when writing queries that may be expensive. I am confident this is false, but In order to address potential skeptics, I wonder if anyone can provide an authoritative or canonical source to prove that these operators are not just functionally the same, but identical in all aspects? This occurs well before anything in the optimizer gets involved. != and <> both return 5, so are indistinguishable in all later operations (including compilation & optimization). Though secondary to the above point, it is also possible (e.g. 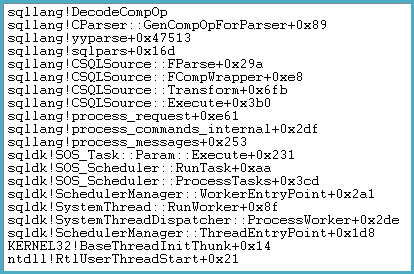 using undocumented trace flag 8605) to look at the logical tree passed to the optimizer to confirm that both != and <> map to ScaOp_Comp x_cmpNe (not equal scalar operator comparison). * I use WinDbg; other debuggers are available. Public symbols are available via the usual Microsoft symbol server. For more information, see Looking deeper into SQL Server using Minidumps by the SQL Server Customer Advisory Team and SQL Server Debugging with WinDbg – an Introduction by Klaus Aschenbrenner. I work at Microsoft in SQL Support and I asked Jack Li, Senior Escalation Engineer and Subject Matter Expert of SQL Server performance, "Does SQL treat != any differently than <> ?" and he said, "They are the same." I think the following proves that <> doesn't do 2 comparisions. SQL Standard 92 defines <> as not equals operator , (http://www.contrib.andrew.cmu.edu/~shadow/sql/sql1992.txt ) . Technically, != is an extension to the standard (even though I can't think about any RDBMS that doesn't implement it). 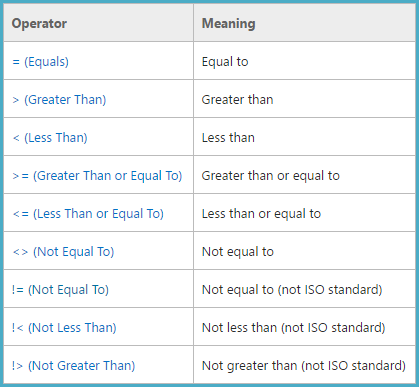 If SQLServer treated <> as 2 operators, not one, it would do the same for >< which is in fact syntax error. And if you look at an execution plan where != is used, under Predicate, it changes != to <>. Not the answer you're looking for? Browse other questions tagged sql-server performance operator or ask your own question. What are the top 3 performance Issues that you encounter with your SQL Servers?